Couscous is probably my favourite speedy food. It’s the perfect blank canvas for easy comfort food and while it can turn super delicious with very few additions, it never feels heavy, but always keeps its delicate flavour and appearance. 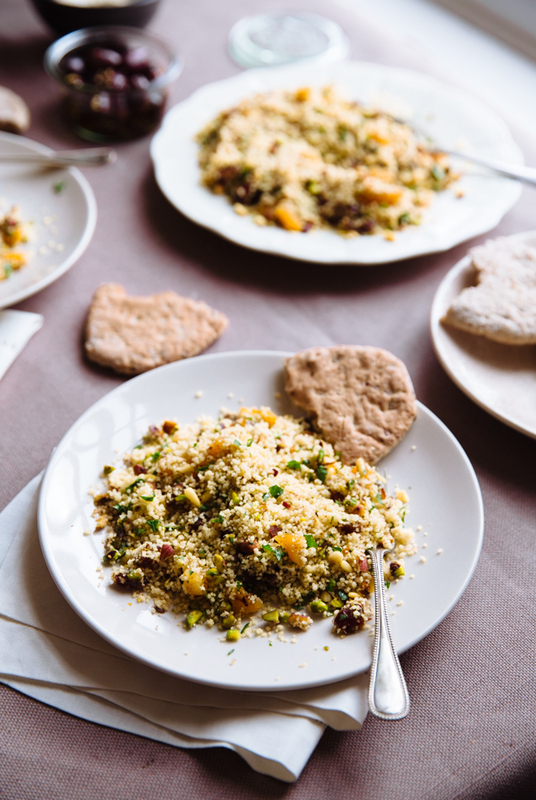 Now that spring is (almost) around the corner, more so than before, I crave food that’s full of flavour, but also light; fresh salads filled with greens and herbs are on heavy rotation again and what I most often go for for a main is a plate of delicious couscous. 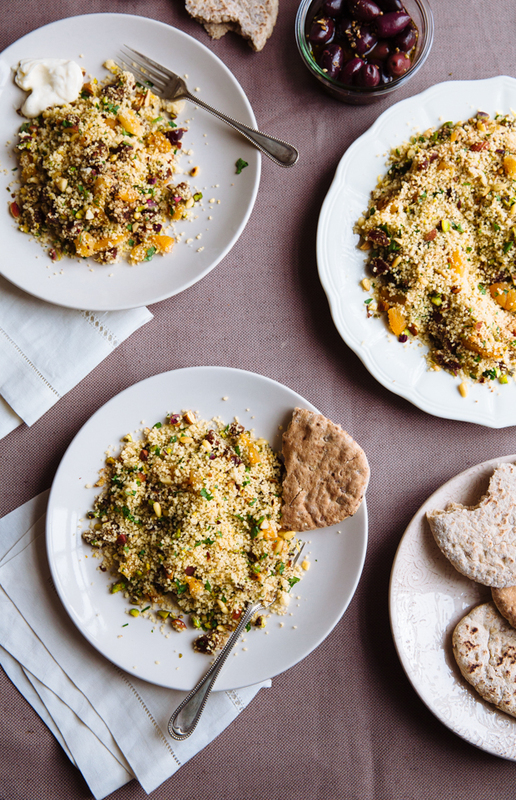 I’ve made this vegetable variation with broccoli & cauliflower a couple times, but for this spicy fruit & nut couscous, the real thing is required. 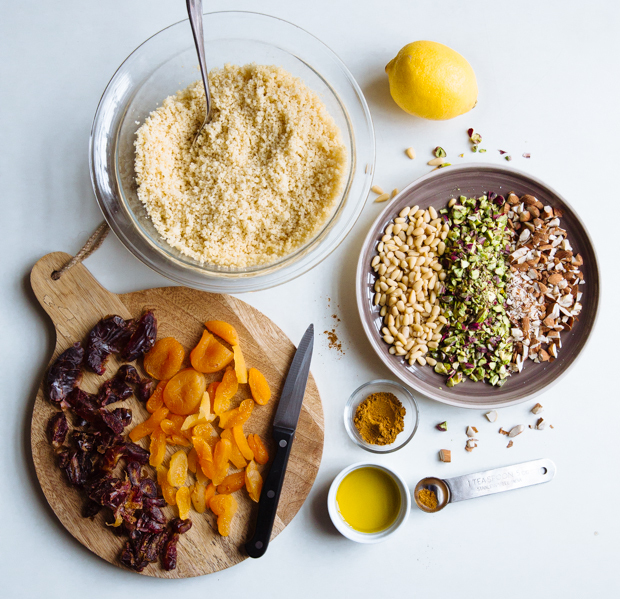 Fluffy and tasty on it’s own, couscous is simply tossed here with ras el hanout, toasted almonds, pistachios and pine nuts and combined with sweet and succulent dried apricots and dates, lots of fresh parsley and a generous dose of lemon zest. 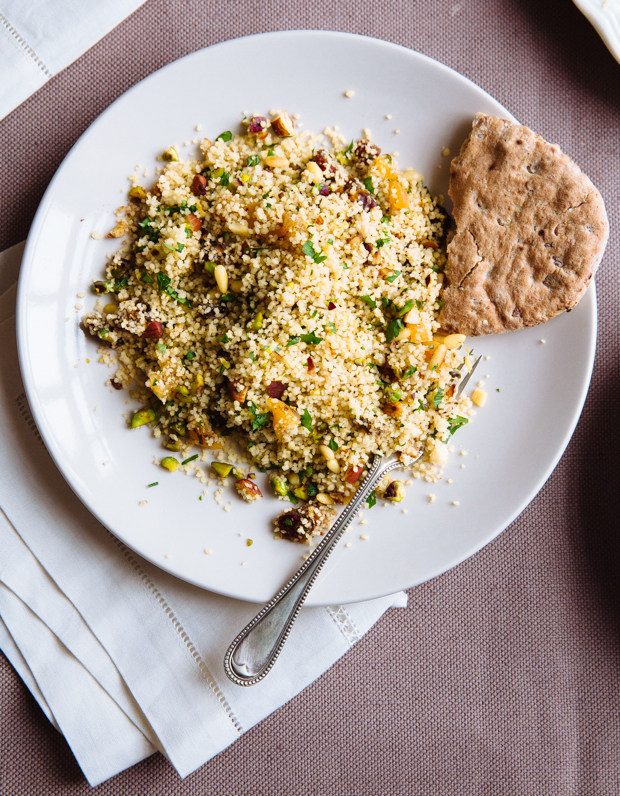 Everything I love about couscous is right here: the subtle earthy couscous flavour and texture, perfectly balanced out by the nutty flavours and crunchiness from the pistachios, almonds and pine nuts. And it all comes together perfectly with just the right amount of sweetness from the fruit and spice from the ras el hanout. 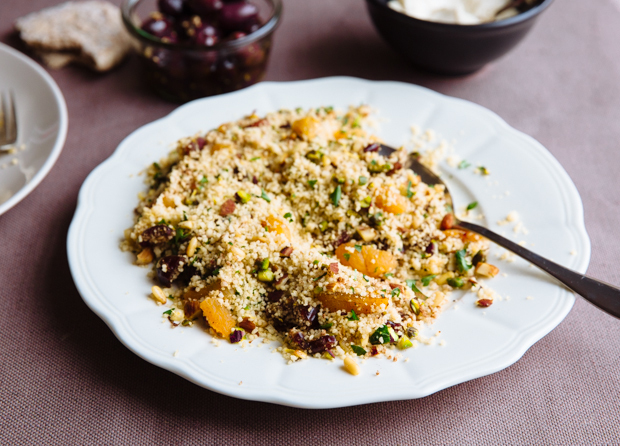 Serve your spicy fruit & nut couscous with marinated olives and a yogurt, olive oil and garlic dip and surrender to the endless allure of humble couscous, the king of the quick and easy meal, perfect host of spices, nuts, fruit and all things delicious. 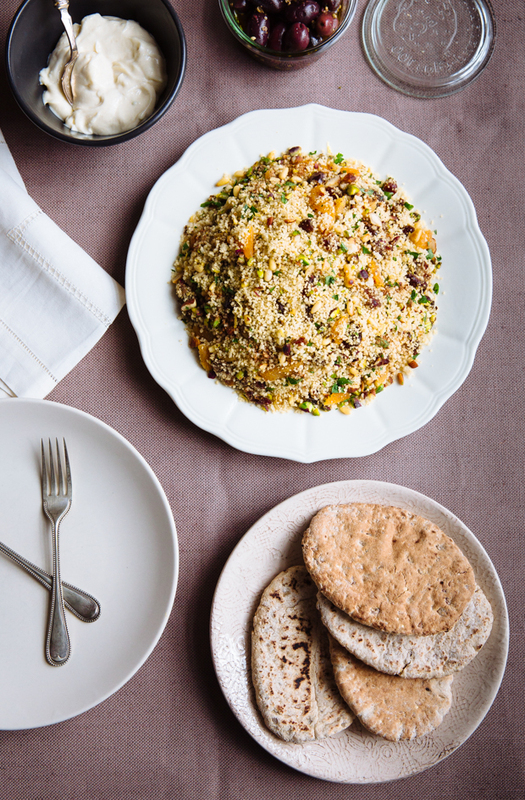 Cook the couscous according to pack instructions and fluff up with a fork; set aside. Warm 1 tablespoon ghee in a large frying pan over medium heat. Add the nuts and cook until they smell nutty and delicious- about 4′. 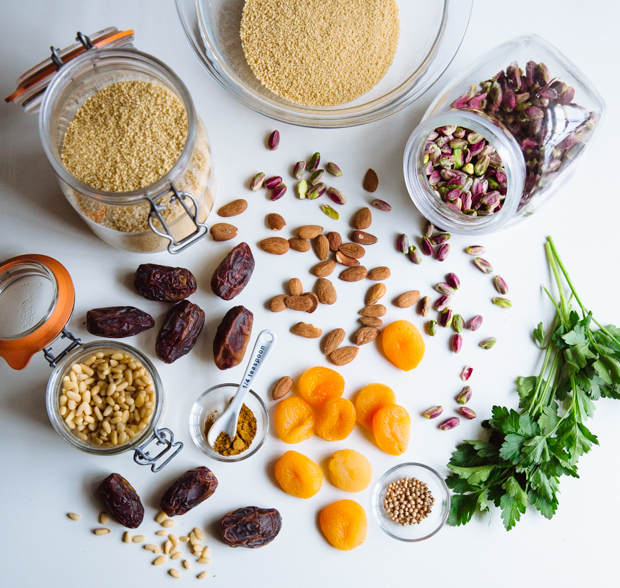 Add the chopped fruit and ras el hanout, combine with the nuts and cook for another 3′. Turn off the heat and add the couscous, fresh parsley and lemon zest. Season with salt and pepper to taste, add the remaining two tablespoons of olive oil and pile on a serving dish. Sounds great… But why is it not vegetarian? Did you mean vegan? Sorry, I referred to the broccoli & cauliflower couscous as vegetarian- what I meant to say is ‘vegetable’. It’s been corrected, thanks!